I have totally been having one of those days. And at the end of a day like today, grilled chicken and steamed veggies just ain’t gonna cut it. But I also don’t want to spend hours in the kitchen cooking up a feast worthy of a major guilt trip afterwards. I just want something yummy (i.e., not healthy) that will be ready in the time it takes Special Agent OSO to do his 3 special steps. So Mexican Lasagna is what’s on the menu tonight in our house. There might also be a michelada or two (or 3). Preheat oven to 375°F, and coat a 8-inch cake pan with cooking spray. Season beef with salt and pepper and brown over medium heat. Pour broth into a sided container and dip each tortilla in, making it moist but not soggy. Place tortilla at the bottom of the pan, then top with 2 T sour cream, 1/4 cup meat, a scattering of black beans, 2 T salsa, 1/3 cup shredded cheese, and 2 T chilies, if using. Top with another tortilla and repeat with 3 more layers of filling, finish with a final tortilla on top. Spread remaining salsa and cheese on top, covering the final tortilla. Spray one side of aluminum foil with cooking spray, and place that side down on top of pan. Bake for 30 minutes, serve hot with additional salsa and sour cream if desired. Posted in Dinner, Recipes and tagged comfort food, dinner, lasagna, mexican. Bookmark the permalink. This sounds easy enough for even me to pull off! 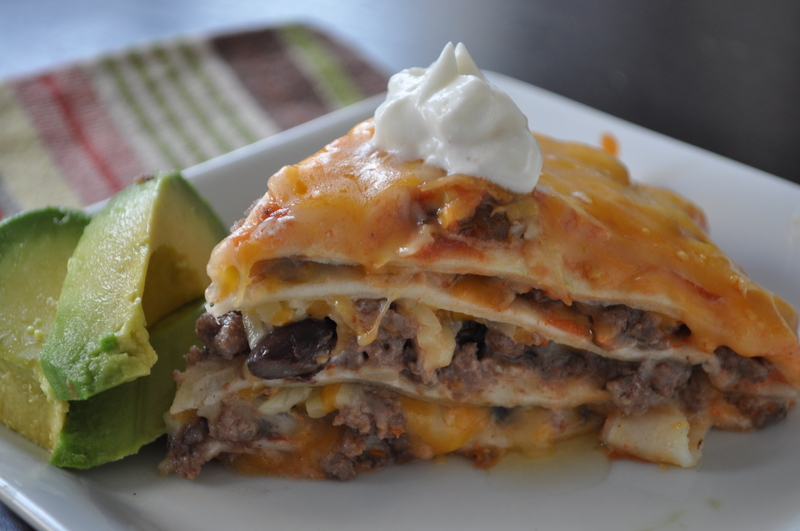 Oh, I love this idea – using tortillas as lasagna sheets! Beautiful!